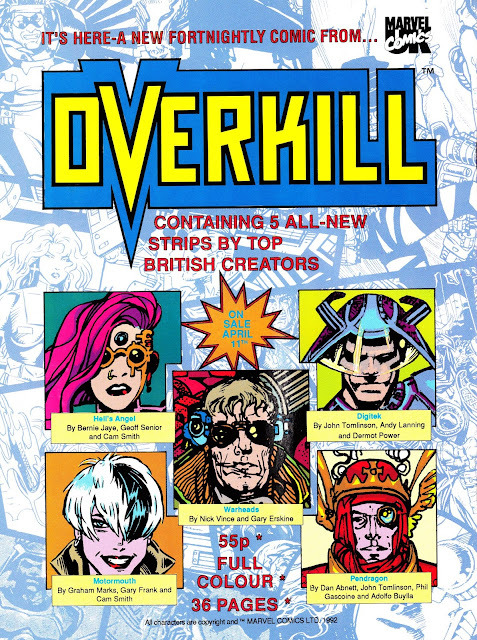 Specially selected to tie-in with the announcement that Marvel are reviving the characters from the MARVEL UK sub-universe/ GENESIS 92 line, here's a British House Ad for the launch of OVERKILL, the (ultimately short-lived) fortnightly (latterly monthly) that housed some of the line's main strips. This is the original line-up before DEATH'S HEAD II muscled-in and - unfortunately - the quality dropped. All of the five strips, in extended form, boasted their own solo books on the other side of the Atlantic (all of which were shipped back to the UK and sold via comics stores) but were serialised in OVERKILL. It took Marvel UK 20 years to realise that the best way to compete with the likes of 2000AD was to offer their own - unique - take on the Marvel Universe... only to find the market for comics in the UK had collapsed too far to make such a new launch viable. The US side vanished suddenly, in early 1994, a victim of the implosion of the American market.